First Time Home Buyer Certification: Attendees will learn the steps in the home buying process, how to develop a personal home buying team, how to become financially prepared and will receive Home Buyer Certification when completed. Only $55 per household. 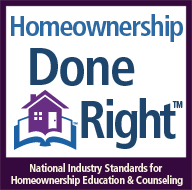 The Road Home: In this online, self-paced workshop, you will learn about programs to assist income eligible first time homebuyers, get to know the steps in the homebuying process, and receive the necessary certification required by many first time homebuyer programs. Tenant Rights & Responsibilities: Learn from a professional housing counselor how the law protects you as a tenant, different types of tenancies, safe housing code and repair, options available if you are facing eviction and tenants in foreclosure proceedings. How to Be a Good Landlord: Presented by a local attorney, specializing in landlord and tenant law, this workshop covers a variety of topics including buying a rental property, preparing a unit for rental, screening tenants, lease agreements, security deposits, and duty to repair. Financial Wellness: Are you in debt? Do you need help managing your finances? Our three step program includes improving your credit score, increasing cash flow and financial planning. Gain the tools to manage your finances wisely and become financially successful! All workshops are held at our training center located at 12 East Worcester Street, 2nd floor, Worcester. See all our upcoming HCEC Education and Training events by clicking here to visit our Calendar Page.